It's toy wrapping time in Gurgaon! Toybank Delhi organized a second wrapping session in Gurgaon. 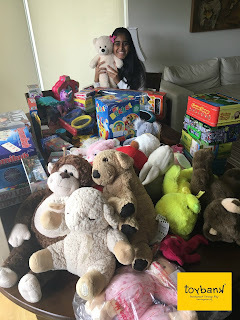 The toys collected were from various organizations in and around NCR - Genpact (Delhi and Gurgaon), NSN (Noida) and Parent Pride - Play School and Day Boarding, Sec 55, Noida. Toybankers Mita, Paromita, Saahil, Aseem and Yogesh got together and wrapped around 150 - 200 toys at Heritage City, Gurgaon on 16th of April. Now it's time to distribute these toys to the tiny little hands which will be delighted to have them! "As always it was a heartwarming experience when people from different walks of life get together for a cause, it give a sense of purpose." "It was the first toy wrapping event which I attended and I must say it wasn't easy. 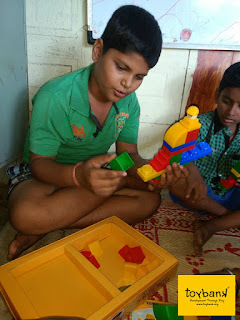 Wrapping 150-200 toys and cleaning up the messed up house, it was back-breaking.But the only thing which kept us going was the fact that our efforts are going to bring smiles on so many faces." "I enjoyed the time we spent together. I hope we are going to rock the Toy Distribution event also." " The event was a great experience and gave us the insights of actual, behind the scene jobs that were earlier done by others including Swetha and Mita. These tasks are always finished while working in teams so cheers to all of us." "You guys did a wonderful job at helping pack those things in the appropriate places. Cheers and see you all at the toy distribution event!"